GTC is delighted to celebrate the success of one of our partners; Pablo Melo Hoffmann, Executive Director of Sociedade Chaua in Brazil, has been granted the prestigious Marsh Award for his leadership in tree conservation. The Marsh Awards recognise the efforts of exceptional conservationists to raise awareness about the issues facing threatened species and building lasting programmes to protect them. Pablo is an exceptional conservation biologist who has devoted his career to ensuring the survival of southern Brazil’s lesser-known threatened tree species. 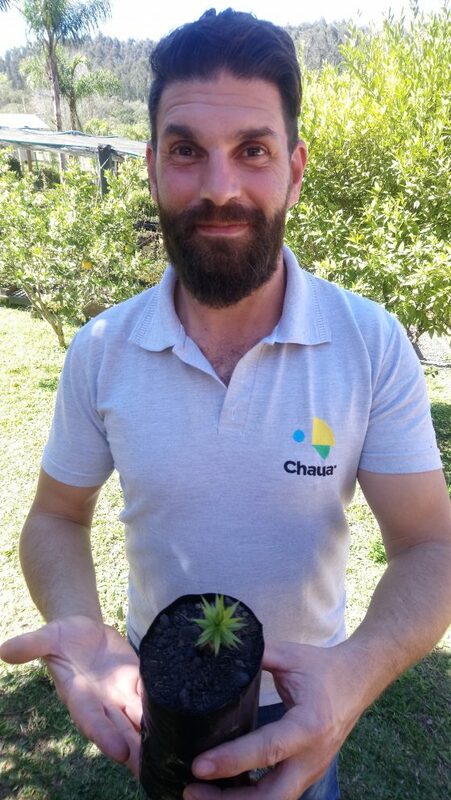 Having witnessed many beautiful but increasingly rare trees under threat in the field, Pablo, with his friends, established a local NGO named Sociedade Chauá. His home became HQ, with a tree nursery built on his land. Throughout the early years, Pablo volunteered around the clock to get Chauá’s work off the ground. Pablo hard at work; credit: Marília borgo/Sociedade Chauá. We are working with Chauá to catalyse a change in restoration practice. Many restoration projects in southern Brazil plant out common tree species, but at least 70 native tree species are extremely rare and heading toward extinction. Our collaboration, spearheaded by Pablo’s leadership, is having an impact, with more than 20,000 seedlings from 40 of the most threatened and lesser-known species, planted out across the landscape. This is helping to reduce the extinction risk for a number of amazing species – including palms, imbuias, araucarias and “tomato trees” – and is enriching the diversity of the wider forest. Pablo is an advocate for tree conservation and has recently been developing partnerships with tree nurseries, other NGOs, and farmers, to successfully argue the case for using threatened trees in their restoration work. To date, Pablo has supported 11 other tree nurseries and 25 farmers to grow and plant threatened trees they were not before. It is this inspirational leadership, enthusiasm, and tireless dedication, that has won Pablo such high praise. We are very proud to count Sociedade Chauá as a key partner and that Pablo’s devotion to Brazil’s forgotten tree species has been deservedly recognised. The Marsh Award for Terrestrial Conservation Leadership is run by the Marsh Christian Trust, in partnership with Fauna and Flora International (FFI). There is also an award for Marine Conservation Leadership, which this year went to grantees of the Conservation Leadership Programme; Leandro Luis Tamini for his work on seabirds, and Erika Gress for her work on coral reefs. The Conservation Leadership Programme helps early career conservationists develop by providing project funding, mentoring and training.